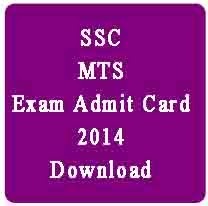 All those candidates who are waiting for Admit card of upcoming SSC written Examination of Multi tasking staff now informed that staff selection commission now started the uploading of the admit card for SSC MTS NT examination 2014. As we know SSC MTS Notification was published region was so admit card will be also hosted region wise by all SSC regional officer. Currently SSC NER North eastern region published the MTS Exam hall ticket / call letter on there official website. Staff selection commission first of all will conduct a common written examination for the recruitment of MTS posts. SSC will hold MTS NT examination 16 February 2014 and 23 February 2014 at various examination centers.